Four persons have been confirmed dead in the early hours of Sunday, 17th March 2019 in a fatal accident at Janikura, few miles to Fufulso Junction in the Central Gonja district of the Savanna region. The four, two males and two females were travelling to Buipe in the Central Gonja district for the weekly Monday market. 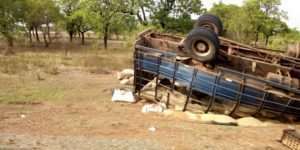 The accident occurred when a cargo truck fully loaded with bags of maize, millet and other kinds of foodstuff veered off the road at a sharp curve in the village of Janikura killing the four persons on the spot. One of the victims told thepressradio.com that the truck had nine persons on board including the driver. It took personnel from the Buipe fire station to come to the scene to rescue the driver through chiseling of the driver side of the vehicle. The driver and four other passengers who are in critical condition have since been admitted to Tamale Teaching Hospital responding to treatment. The witness further revealed that the dead got trapped in the bags of maize in the course of the accident when the car somersaulted capsizing upside down. The four dead persons who were Muslims carried to the West Gonja Hospital in Damongo where laid to rest at about 7:45 PM in the night. The former MP for Damongo/Daboya, Hon.Sammy B.Wusah, NPP chairman for Damongo, Hon. Nana Kwame Aboagye and the MP for Damongo constituency, Hon. Adam Mutawakilu facilitated in the burial process of the victims.